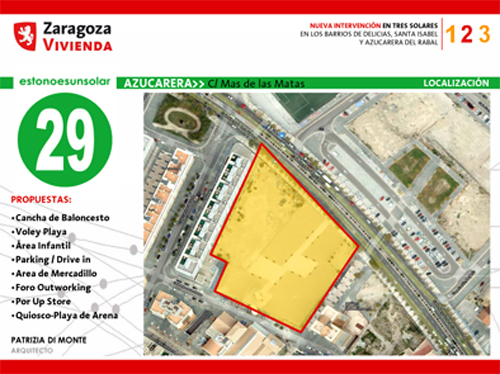 This plan has been made by the Municipal Housing Society of Zaragoza. 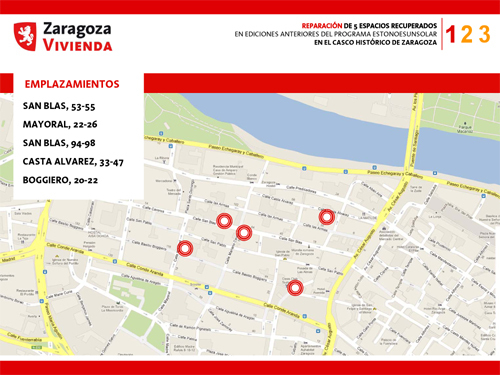 Based on socioeconomic and urbanistic features, it defines 9 zones within the Historic Quarter. Area A has been taken as the subject of this article. Among the activities developed by the City Council under the Employment Plan, the ones performed by “estonoesunsolar” have pointed out. The origin of this group is highly linked to a program promoted by Patrizia di Monte in 2006, called “Everyday’s voids”. 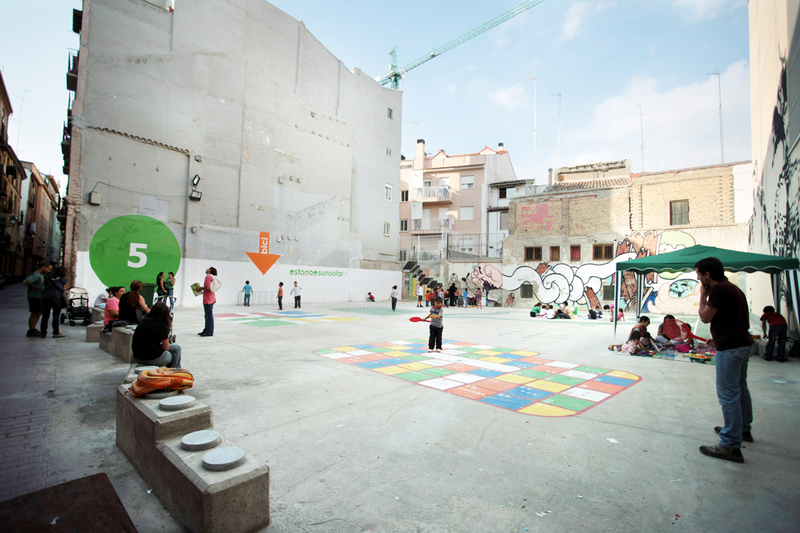 This program led to a serie of artistic interventions that moved the neighbours to ask the City Council to use the empty plots to provide public space over the lack of it. The subject of our research is part of the “barrio de San Pablo” with a surface of, approximately, 35Ha. Institutional infrastructures have a dominant position in the Historic Quarter. San Pablo, has mainly Educational equipments, being four altogether. Actually, it contrasted with the lack of green areas, totaling just under 3100m2. Population has increased more than a 17% due to the arrival of immigration with an age range of 17-64, which led to an increment of more than a 25% in this age range. However, population declined by almost 1.5% because of the substantial ageing of society: 32% was older than 65 years old. The percentage of empty dwellings in this neighborhood, in the period prior to the PICH (Comprehensive Plan for the Historical Centre), was 25%, indicating the large number of abandoned houses because of property interests or as a result of the expulsion of the traditional native population. In addition, in order to create large areas of intervention, many of these plots were abandoned along years that had been abandoned for years and had become landfills. All this generated points of concentration around social issues such as drug addiction or prostitution around these areas. 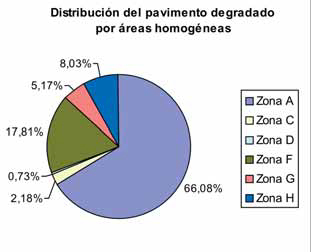 Distribution of degraded pavement by homogenous areas. 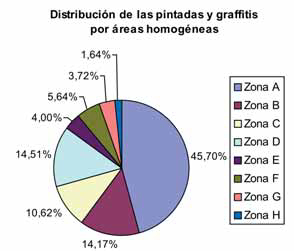 Distribution of graffitis by homogenous areas. – 35.4% doesn’t have a lift. – 4.2 % doesn’t have heat. – 15.6 % face overcrowding. – 19.2 % has unhealthy housing conditions. 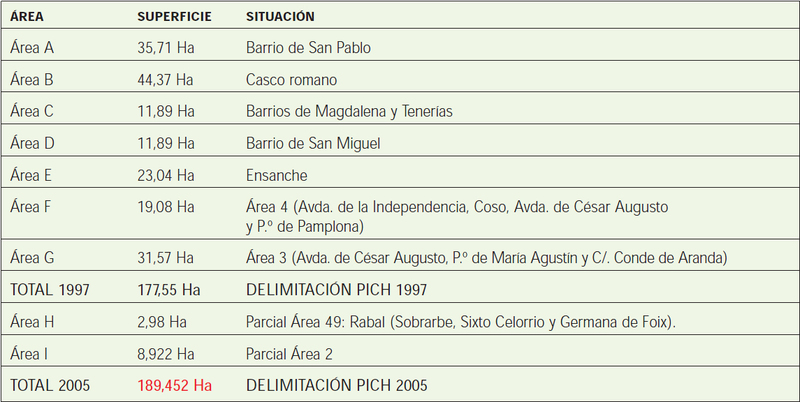 PICH: Building Conservation situation (2004). Private enterprises and public institutions were responsible of a process of urban speculation and gentrification. In order to achieve a higher price of land, there was no immediate interest in building in many brownfield sites. On the other hand, the process of gentrification slowed down by a large influx of immigrants who found in the neighbourhood housing for families with a low income. Nevertheless, the local population was still mainly reduced. Issues relating to urban decline such as the process of ruin of brownfield sites and deserted apartments, were caused by neglect on the part of the landlords and the public administration. This situation gave the neighbourhood a poor image inviting all sort of criminals and practises, as well as becoming a security problem for its citizens. Among others, the increased number of immigrants, the growth of its elderly population and the high rate of degradation present in many of the buildings resulted in a progressive abandonment of the neighbourhood by the local population. The proliferation of bar areas and hostess clubs was, in turn, raising the level of the environmental and acoustic contamination as well as resulting in poor habits of personal hygiene. Firstly, it is ideally placed to become a linchpin: right in the center of Zaragoza and near the Ebro river. Even so, traditional trade continued to shift towards other areas. Taking into account the ageing of population, a 25% of young immigrants was the key to transform the population pyramid. This group created a new commercial environment based on stores of foreign products. 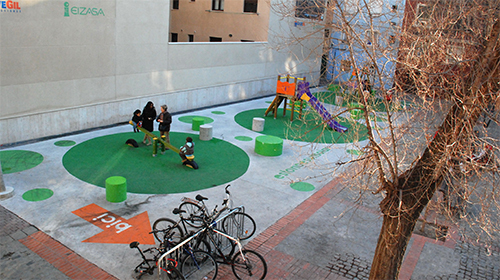 The high number of existing empty plots could turn into all types of public space. This is, thus, the background where the Integrated Project of Urban Regeneration took place. It includes rehabilitation and renovation works, interventions in the public space or equipments and the public or private empty spaces, as well as social, economic and environmental interventions intended to improve the quality of life of people in this area. 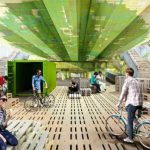 “Estonoesunsolar” emerged in this period as an extension of the festival of urban art by Patrizia Di Monte and Ignacio Grávalos, both architects. The presence of civil society participation was helpful for passing on the initiatives of the sector to the public authorities. 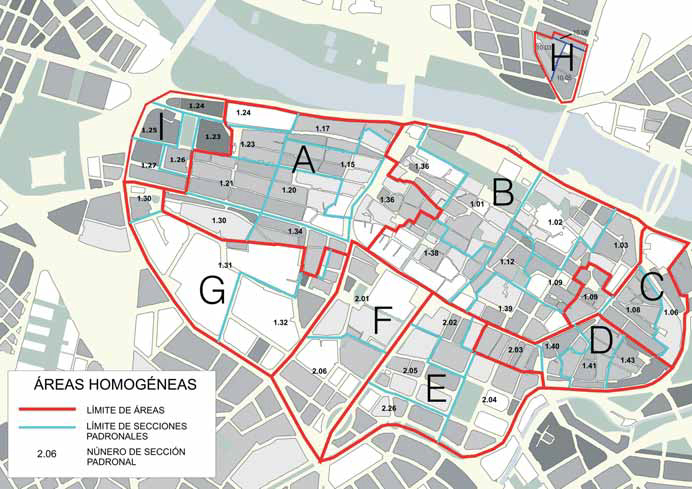 By then, it was also proposed a plan for the reintegration of long-term unemployed, to temporarily reuse the brownfield sites, upon agreement with the landlords, by the Sociedad Municipal Zaragoza Vivienda. 2006. Artistic interventions“Los vacíos urbanos” within the festival of urban art “En la frontera”. Public Participation: Request to the City Hall for reusing the brownfield sites of the city. The program “estonoesunsolar” emerged as an extension of the festival, carried out by Patrizia di Monte. A citizen’s initiative that was passed on to the public authorities as a series of transitional activities. Plan for the reintegration of long-term unemployed with a budget of 1million euros, September 2009. 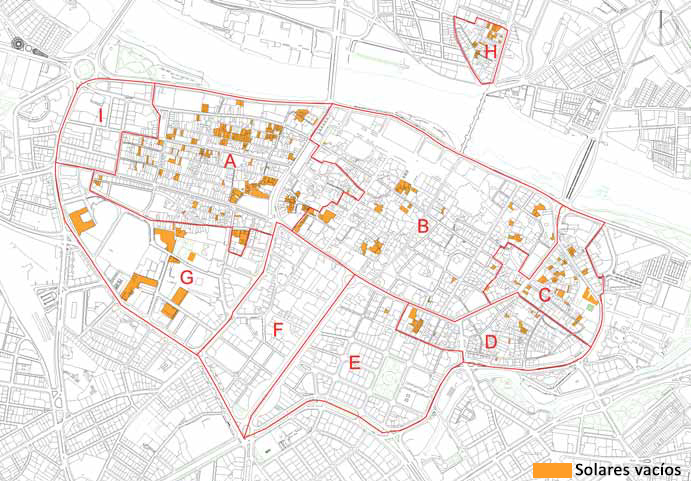 Fitting of five selected vacant plots within the Historical Quarter. It creates employment for 40 long-term unemployed. b) Plot identification. Search of information on the plot, including liens and encumbrances. c) To check the information contained in the Town planning certificate of the plot. d) Development of a transfer convention of the land, signed by owners and Town hall for a year. e) Extension of the proposal to other empty plots. f) Public participation on the proposal and the management programme. “Estonoesunsolar” created a blog as well as a facebook page, where sports, older people, youth and children’s associations could made contributions. RESULTS: The number of plots where an intervention was made, reached the number of 14.
a) Proposal Extension to 2010. Budget of 2million euro. 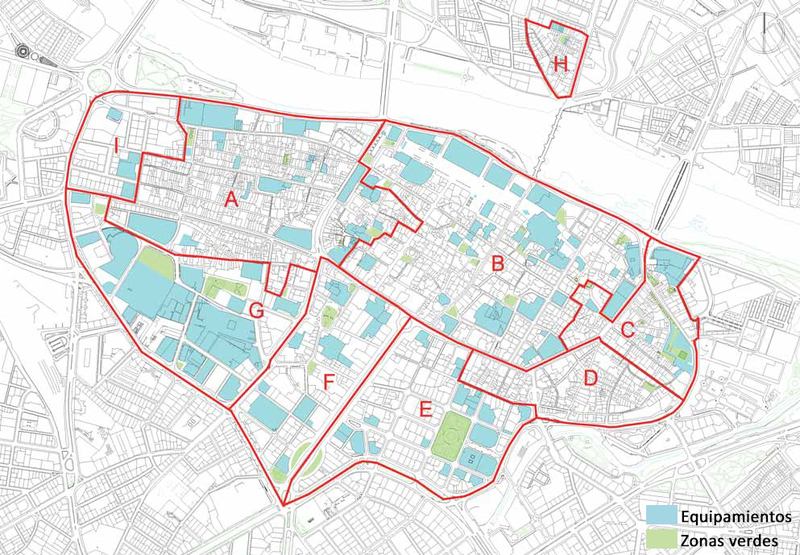 b) The area of operation was extended far beyond the Historic Quarter. c) It creates employment for 80 long-term unemployed. RESULTS: The number of plots in this second phase, reached the number of 14. Altogether, they were six. 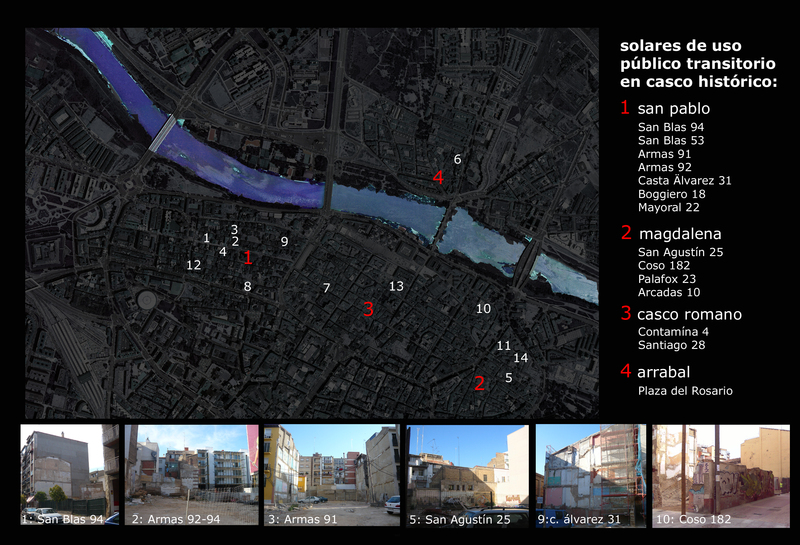 10 ideas about estonoesunsolarr: 28 placemaking examples in the city of Zaragoza. C/ San Blas 53-55: ditch repair work. C/ Mayoral 22-26: Fence replacement. C/ San Blas 94-98: Spring clean, clearing of scrub and installation of a metal part. C/ Costa Álvarez 31, “La bombonera”: Fence replacement including its door, cleaning of the walls and change of land use, from sporting use to public square. Reparation of Recovered Spaces (2012). – Casco Histórico: C/Las Armas 91-92, in San Pablo. 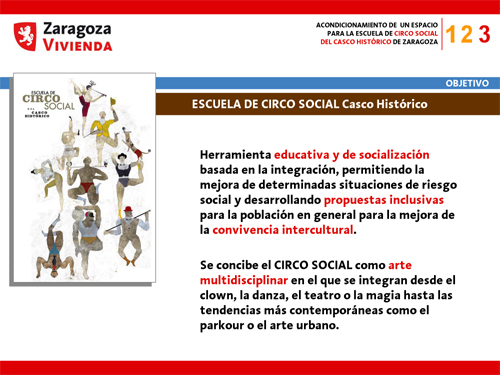 ESCUELA CIRCO. 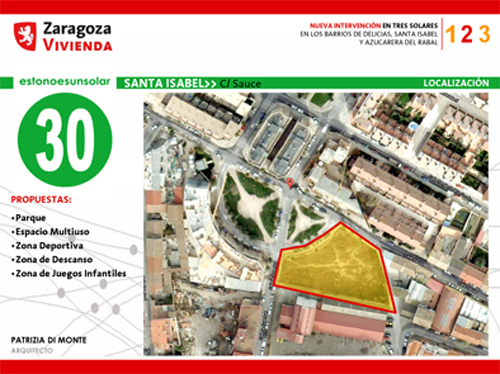 New intervention in three plots in the neighborhoods of Delícials, Santa Isabel y Azucarera del Rabal (2012). 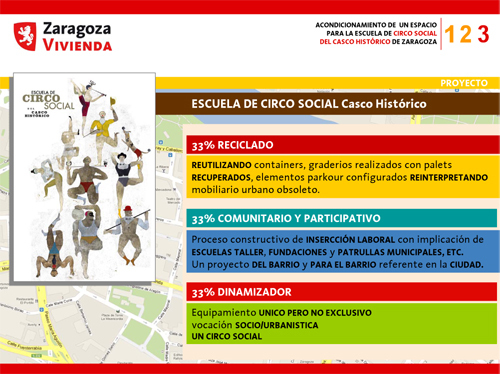 Acondicionamiento de un espacio para la escuela de Circo Social del casco histórico de Zaragoza (2012). The goals of this project were to generate employment and social welfare as to producing the image of the city and in particular the areas of the Historical Centre which are suffering a deteriorating process. 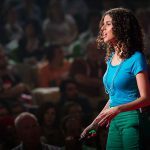 With this goal is been placed value on the idea of the void, the gap, the invisible and the quiet. Producing temporal lightening up in the urban consolidated fabric for creating a flexible and linked public space. Among the empty plots it is searched the potential strategic points of intervention that could achieve to be a new vitality focus. For each plot it is made a socio-economic study of lacks of the area, the public spaces claimed by the neighbours and the population group it will be addressed. 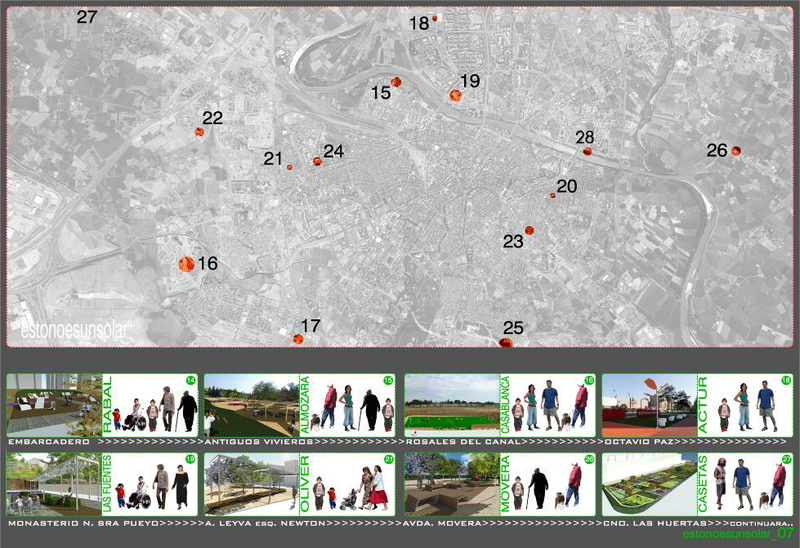 Thus each project mainly starts from the citizen participation, being each plot the outcome of a dialogue process with the community in which the neighbours are involved with the development of the corresponding plot program. Besides that participate in the management of different interventions which will happen on it, since they are carried out by the associations (like neighbours, juvenile, sporting, elderly, etc.) of each area. By doing so, it is created a linked voids net with different public uses which answer to the neighbours’ local necessities. This way they are connecting with each other, making up a flexible suitable alternative for the public space. At the beginning of each Project the collective participation is a fact. The neighbourhood association and the district board get in contact with each other to decide the use of the plots. The neighbours bring their knowledge about the place and introduce a spontaneity level in the development of the project and the ability to correct mistakes on the go. Besides, the projects are made for the neighbours could have places to meet, places that they could be identified with as collective or as individual. With the different projects that are been making in the plots it is pursued to finish with the marginal image that is given by the numerous abandoned plots that sometimes are used as dumps. This way the city itself acquires a particular image which by it is been knowing in the rest of the world, due to the transcending of the project in an international way, getting, for example, the 1st prize SAIE (Selection 12 awards_Rigenerazione e recupero urbano). Los vacíos reciclados para nuevos usos. Los niños juegan en los columpios (2010). Los vacíos reciclados para nuevos usos. Un espacio público que genera vida en el barrio (2010). The initial goal of the program was the elaboration of an Employment Plan of the Government in 2009, which by providing a job to 40 unemployed workers for the cleaning of the plots. Once they are prepared, it was seen the opportunity to elaborate some proposals that allow the provisional occupation of them. 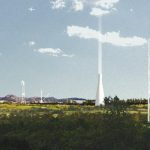 In order to carry out the proposals it was necessary to manage, with the plot’s owners, the allowance to intervene in them, making an agreement that they will give them for free for public use during at least 12 months. All the interventions were low cost, using mostly recycled materials. For that reason the average price in the first phase of the preparation of the plots was around 20€/m2. It is important to note that the budget for the Employment Plan in 2009 was 1.000.000 €, from this, 300.000 were for buying the required materials for the rehabilitation of the plots and the rest of the money was used for hiring the 40 workers. In light of the successful proposal, in the second phase the budget and the employees were doubled. In the end, in the third phase it was proposed a budget of 400.000€, significantly lower than the previous phases, because this time it would be rehabbed just 4 plots, 3 of them from zero and the fourth a change of use. It has been pointed the fact that all the Budget for the different phases is not assigned exclusively for the plots with proposal but they are fixing all the empty plots in the city, between the ones just they are taking action in 31 of them. The urban morphology improves due to the creation of staying areas and green spaces. In respect of the public space and mobility it grows the quantity and quality of the public space. Besides, most of the interventions incorporate parking lots for bikes. It increases the complexity for the inclusion of new cultural uses and the spaces for associations that helps increasing not only the number of legal entities but also the information density. The urban metabolism parameter improves due to the necessity of making low cost actions that leads to the use of recycled materials in most of the cases. Also the plots used as an urban garden has an effect. Nowadays it has been recycled 42.000 m2 of abandoned plots in all the city, and in the San Pablo neighbourhood around 10.000 m2. This implies a surface 3 times bigger than the existing one. Cinco Equipos(2012).Estonoesunsolar. Arquitectura Viva, 145, 50-51. 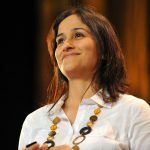 Article written by Ángela Vera Sánchez as case study for WATCH We Are The City Heroes course run by Iván Capdevila for the University of Alicante.